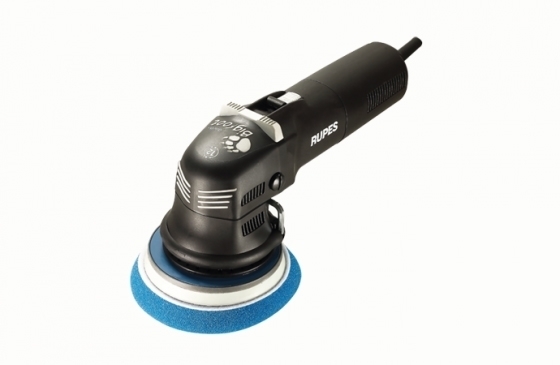 Rupes Duetto 12mm random orbit polisher. Rupes Duetto, random orbit polisher, is an all in one solution both for sanding and polishing needs. A versatile tool ready to cover all polishing steps. After extensive research Rupes resulted in a 12mm orbit for Duetto. This orbit proved to be the most efficient when sanding or polishing to deliver brilliant results. Be it repairing paint defects or smoothing an "orange peel" effect on paint via sanding, Duetto will leave a smooth area with the least possible demands in the next polishing steps. With dual action antispinning protection, the Duetto will prevent uncontrolled spining of the pad when not in touch with the surface. This will protect the user and the materials themselves as well.